Hydrate while treating skin sensitivity with this lightweight moisturizing treatment from Bioderma. Formulated for sensitive and reactive skin types, Sensibio Light Cream instantly soothes redness, irritation, and tightness with a silky, ultra-absorbent texture. Patented Toléridine™ complex strengthens the skin’s resistance to irritants, helping it become less sensitive over time. After cleansing, apply cream on your face and neck. Use daily. 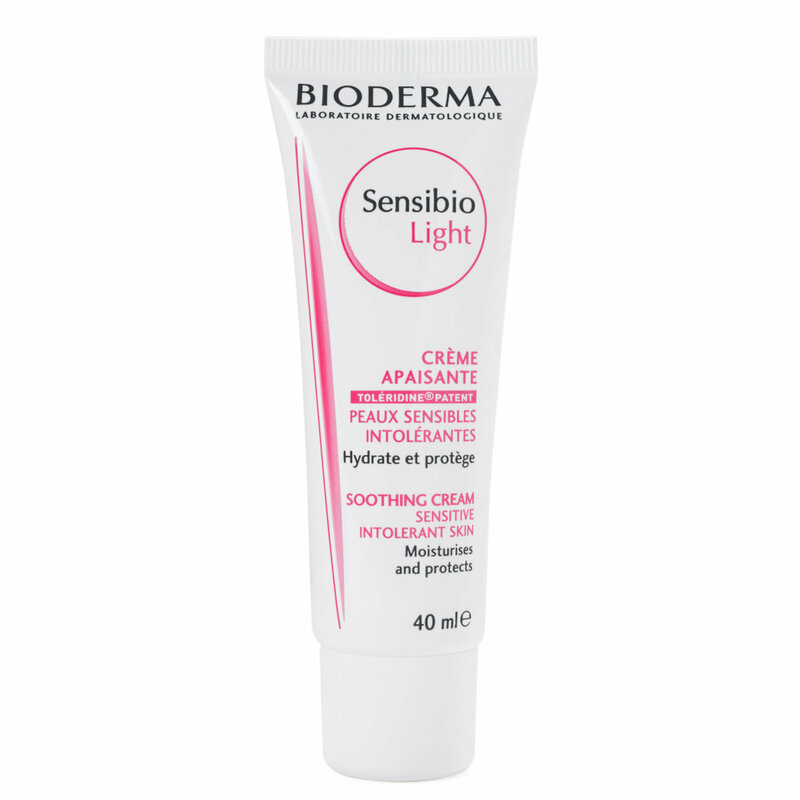 Have a question about Bioderma Sensibio Light Cream? My skin is sensitive and acne prone, and I'm on a high dose of retin-a. My regular routine of light hydrating layers wasn't cutting it so I started testing moisturizers. I tried so many, and they all either irritated my skin or caused breakouts. This moisturizer has saved me! I use it morning and night after my regular routine. It keeps the flakes away and locks in moisture. It is very creamy yet somehow still very light. It wears well under makeup and sunscreen, and never leaves me feeling greasy. It isn't fancy, and doesn't do anything but moisturize, but that's really all I'm looking for with this kind of product. I would not recommend this for dry skin, but for anyone else with normal to oily skin this is gold. I hope Bioderma never stops making this! I first found bioderma when i was on a trip to Paris, and was in dire need of a good moisturizer because my face was itchy and flaky and dry (from the plane ride over but also because i have eczema and very sensitive skin). This product is literally magical, it has made my skin soft and moisturized. I ditched my acne cream for a week to see what happened and bioderma sensibio light cleared up my acne faster than the actual medicine did. I was over the moon when bioderma expanded to the US, because that might I didn't have to pay the extra money to get it shipped from France! Basically what I'm saying is this is miracle lotion and everyone should buy it. I had been looking for a moisturizer that better suits the specific needs of my skin, which is pretty sensitive. After a bit of research on Beautylish, I thought this looked like something that would work well for me so I decided to give it a shot and I'm so glad I did! It feels lightweight yet it's effective and gets your skin hydrated, has no fragrance, and works great as a makeup primer too! Cara from Beautylish recommended this to me because I have pretty sensitive skin that gets red easily and this calms it down without leaving a heavy greasy feel to my skin. After testing it out I now use it in my pro kit for clients with sensitive skin and for photo shoots where I need to limit the layers of products on the face because it acts as a primer as well. I will say though if you have dry skin this isn't going to be the best option for you because it's not going to give enough hydration to prep your skin for a flawless foundation application. I never write reviews, but I want people to know how good this product is. I have oily/acne-prone combination skin, and this lotion is probably the best I've ever used. My skin feels incredibly soft, immediately noticed a reduction in redness/breakouts and uneven texture. My skin is less oily as well. My only request is that Beautylish start stocking this in a larger size! It has almost no fragrance, and light texture. It didn't work for me. I have sensitive dry skin with once in a while breakouts. It caused some itching. This moisturizer is the best I have ever used. Ever. I have combination, leaning toward dry, acne-prone, hypersensitive skin. This feels so good. It moisturizers and soothes my skin like no other. Also, the glow is REAL with this. Perfect alone or under makeup. Buying forever. Not bad compared to my La Roshe Posays. So similar but Bioderma is cheaper. Very effective for combo, sensitive and acne prone skin. Even though is good I like the Bioderma Tolerance the one with the pump better. I won't repurchase this one but the Tolerance I would. It's still a good product no irritations for me. Moisturize pretty well and light. I didn't look greasy at all.